7850. John Howard "Jack" STEPHENSON (Dwight Tredway STEPHENSON , Margaret ROGERS , Mary Catherine THIELL , Hannah BITLER , John Wolf , John , Johannes ) was born on 8 Dec 1918 in IL. He died on 26 Oct 1990 in Madison, WI. Jack resided in 1920 in 853 Holyoake Rd, Edwardsville, Madison Co, IL. He resided in 1930 in 1718 Summerdale Ave, Cook Co, Chicago, IL. He resided in 1935 in 709 South Liberty, Freeport, Stephenson Co, IL. He resided in 1940 in 709 South Liberty, Freeport, Stephenson Co, IL. He worked as retail salesman - mail order clothing in 1940. 13397 M i Barry H STEPHENSON. 13398 M ii John Dwight STEPHENSON. 13399 M iii Mark STEPHENSON. 7851. Roberta Jane STEPHENSON (Dwight Tredway STEPHENSON , Margaret ROGERS , Mary Catherine THIELL , Hannah BITLER , John Wolf , John , Johannes ) was born on 16 Aug 1922 in IL. She died on 20 Jul 1964 in Madison, WI. Roberta resided in 1930 in 1718 Summerdale Ave, Cook Co, Chicago, IL. She resided in 1935 in 709 South Liberty, Freeport, Stephenson Co, IL. She resided in 1940 in 709 South Liberty, Freeport, Stephenson Co, IL. She resided in Jul 1964 in Madison, WI. 13400 F i Celia SCHULTZ. 13401 F ii Laura Ann SCHULTZ. 13402 F iii Linda SCHULTZ. 13403 F iv Mary Beth SCHULTZ. 13404 M v Michael Crain SCHULTZ. 7855. Cecilia Anne "Ann" STEPHENSON (Dwight Tredway STEPHENSON , Margaret ROGERS , Mary Catherine THIELL , Hannah BITLER , John Wolf , John , Johannes ). Ann married Ben George TRICKER, son of Claude TRICKER and Doris CROSBY. Ben was born on 5 Apr 1926 in Dodgeville, Iowa Co, WI. He died on 31 Dec 2004 in Freeport, Stephenson Co, IL. Ben was issued a social security number before 1951 in IL. He served in the military with U.S. Marine Corps. He served in the military with U.S. Navy. He served in the military with U.S. Army. He served in the military with in WW II. He served in the military with in Korean Conflict. He received a military award of Combat Infantryman's Badge. He received a military award of Bronze Star. He received a military award of European Theater with two battle stars (Rhineland and Central Europe). He worked as journeyman electrician with National Lock from 1956 to 1968 in Rockford, IL. He worked with Kelly-Springfield Tire Co from 1968 to 1978. He worked with Dean Foods from 1978 to 1988 in Pecatonica, IL. + 13405 F i Pam K TRICKER. 13406 M ii Joseph M TRICKER. + 13407 F iii Lois TRICKER. + 13408 F iv Patricia E "Patty" TRICKER. + 13409 F v Barbara J TRICKER. 13410 F vi Gail TRICKER. Gail also married [Male] WHITE. 13411 F vii Diane K TRICKER. + 13412 F viii Carol TRICKER. + 13413 M ix Andrew Christoher TRICKER. 7860. Bruce Herbert WEBSTER Jr 1 (Bruce Herbert WEBSTER , Inez ROGERS , Mary Catherine THIELL , Hannah BITLER , John Wolf , John , Johannes ) was born on 3 Sep 1920 in Wharton, Wharton Co, TX. He died on 12 Dec 2002. He was buried in Evergreen Memorial Park Cemetery, Wharton, Wharton Co, TX. Bruce resided in 1930 in Houston, Harris Co, TX. He served in the military with U.S. Army on 15 Jul 1942. He was issued a social security number before 1951 in TX. He worked as painter with Texasgulf Sulfur Company. He resided in Dec 2002 in Boiling, Wharton Co, TX. He was a member of Christ Episcopal Church in Matagorda, TX. He was a member of Boling Lions Club. He was a member of Wharton Masonic Lodge No. 621. Bruce married Muriel TRIFFITT 1. Muriel died before Dec 2002. + 13414 F i Susan Muriel WEBSTER. + 13415 F ii Glenna Margaret WEBSTER. 13416 F iii Christine Elizabeth WEBSTER. 7861. Dr. Harry Lyle "Lyle" ACTON [scrapbook] 1, 2, 3 (Alberta May THIELL , Casper Lee THIELL , Elija Christ THIELL , Hannah BITLER , John Wolf , John , Johannes ) was born on 30 Sep 1906 in Springfield, Sangamon Co, IL. 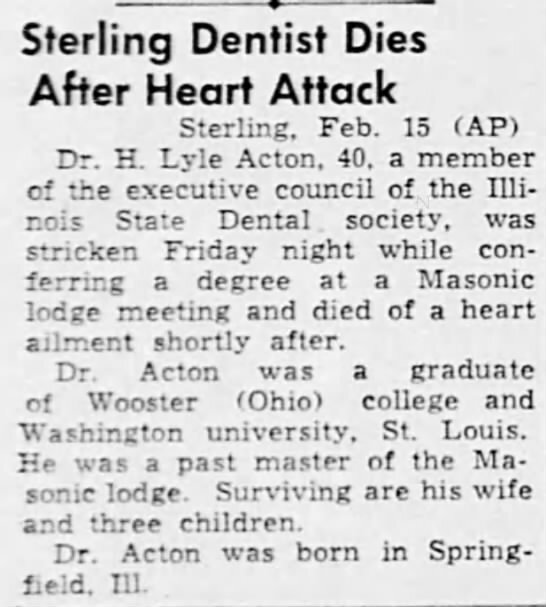 He died on 17 Feb 1947 in Sterling, Jordan Twp, Whiteside Co, IL. He was buried in Oak Knoll Memorial Park Cemetery, Sterling, Whiteside Co, IL. Lyle married Bernice J COLLINS [scrapbook] 1, 2, 3, daughter of Arthur C COLLINS and Jennie A HOBSON, in 1930/1940. Bernice was born on 20 Jul 1909. 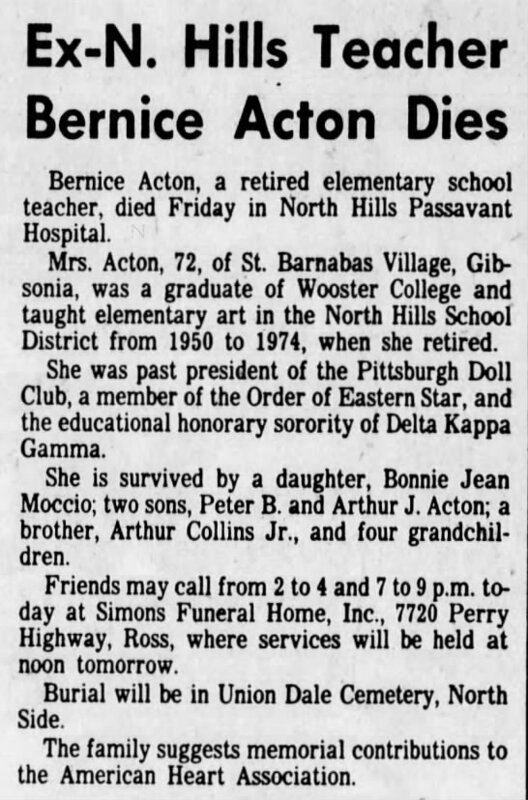 She died on 11 Jun 1982 in North Hills Passavant Hospital, Pittsburgh, Allegheny Co, PA. She was buried in Union Dale Cemetery, Pittsburgh, Allegheny Co, PA.
Bernice worked as elementary school teacher (art) with North Hills School District from 1950 to 1974 in Pittsburgh, PA.
13417 F i Bonnie Jean ACTON. 13418 M ii Peter B ACTON. 13419 M iii Arthur James ACTON. Arthur married Mary Ann EBERHART. Arthur also married Mary Ann CZAJKOWSKI. 7863. Martha Geneva WARD 1, 2 (Ruth Myrtle THIELL , Casper Lee THIELL , Elija Christ THIELL , Hannah BITLER , John Wolf , John , Johannes ) was born on 29 Mar 1915 in Elgin, IL. She died on 21 Dec 2004 in St. John's Hospice, Springfield, Sangamon Co, IL. She was buried in Oak Ridge Cemetery, IL. Martha resided in 2003 in Springfield, Sangamon Co, IL. She worked as maintenance with State of Illinois. Martha married Earl Raymond PEARSON 1, 2, son of Victor Emil PEARSON and Zenith Ruth HECKETHORN, in 1933. Earl was born on 11 Mar 1913 in Douds, Van Buren Co, IA. He died on 6 Nov 1983 in Springfield, Sangamon Co, IL. 13420 F i Juanita PEARSON. + 13421 M ii Raymond E PEARSON was born on 19 Aug 1937. He died on 18 Jun 2003. 13422 F iii Linda PEARSON. 13423 F iv Barbara Jo Ann PEARSON. 7871. Dr Donald Thiell LEE 1 (Eleanor Francis THIELL , John E THIELL , Elija Christ THIELL , Hannah BITLER , John Wolf , John , Johannes ) was born on 14 Sep 1931 in Neodesha, Wilson Co, KS. He died on 8 Feb 2002 in Cheyenne, Laramie Co, WY. He was buried in 2002 in Neodesha, Wilson Co, KS. Donald was issued a social security number before 1951 in KS. He served in the military with U.S. Air Force in Korean War. He graduated with B.S. Microbiology from Kansas University. He graduated with M.S. Virology from Kansas University. He graduated with M.S. Public Health from University of North Carolina in 1966 in Chapel Hill, NC. He graduated with Dr. Public Health from North Carolina University in 1968 in Chapel Hill, NC. He worked as Director with Wyoming Public Health Laboratory from 1968 to 1987. He was a member of Association of Public Health Laboratories. Donald married [Female] DAUM on 24 Aug 1958 in Independence, Montgomery Co, KS. 13424 M i Harold LEE. 13425 M ii Gene LEE. 7873. Harold B THIELL 1, 2, 3 (Harold K THIELL , John E THIELL , Elija Christ THIELL , Hannah BITLER , John Wolf , John , Johannes ) was born on 9 Jul 1927 in MO. He died on 19 Mar 1997 in McHenry, McHenry Co, IL. Harold resided in 1930 in 1247 Chase Ave, Chicago, Cook Co, IL. He resided in Mar 1997 in McHenry, McHenry Co, IL. He was issued a social security number . Harold married Betty Jean BUESS 1, 2, daughter of Roy S BUESS and Elizabeth DUNCANSON, on 12 Oct 1954 in Chicago, Cook Co, IL. Betty was born on 10 Jan 1930 in Chicago, Cook Co, IL. She died on 12 Apr 2016 in Johnsburg, McHenry Co, IL. Betty resided in Johnsburg, McHenry Co, IL. 13426 M i Matthew THIELL. + 13427 M ii Peter THIELL. 7875. William Ellsworth ZIMMERMAN 1 (Lillian May BREINICH , Joanna RUPERT , Amos J RUPERT , Maria BITLER , John Wolf , John , Johannes ) was born on 31 Aug 1904 in Girardville, Schuylkill Co, PA. He died on 7 Oct 1987 in Ringtown, Schuylkill Co, PA.
William resided in 1910 in West Mahanoy Twp, Schuylkill Co, PA. He resided in 1920 in West Mahanoy Twp, Schuylkill Co, PA. He worked as Slate Picker - Coal Co in 1920. He resided in 1930 in Main St, Ringtown, Schuylkill Co, PA. He worked as Fireman - Coal Mine in 1930. William married Blanche L DRESHER 1. Blanche was born in 1912 in PA. She died in 1982. Blanche resided in 1930 in Main St, Ringtown, Schuylkill Co, PA.
+ 13428 M i William S "Zip" ZIMMERMAN was born on 7 Dec 1929. He died on 26 May 2009. 13429 F ii Virginia ZIMMERMAN. + 13430 M iii Robert G ZIMMERMAN Sr.
Donald ZIMMERMAN 1 died before May 2009. 13432 M v Thomas ZIMMERMAN. 13433 F vi Frances C ZIMMERMAN. 7876. Hazel J ZIMMERMAN 1 (Lillian May BREINICH , Joanna RUPERT , Amos J RUPERT , Maria BITLER , John Wolf , John , Johannes ) was born on 6 Aug 1908. She died on 27 Aug 1975. Hazel resided in 1910 in West Mahanoy Twp, Schuylkill Co, PA. She resided in 1920 in West Mahanoy Twp, Schuylkill Co, PA. She resided in 1930 in North Manheim Twp, Schuylkill Co, PA.
Hazel married George Washington YEICH 1, son of Samuel YEICH and Sally FIELDS, on 16 Jul 1924 in Schuylkill Co, PA. George was born on 19 Jan 1901 in PA. He died on 12 Mar 1975. George resided in 1930 in North Manheim Twp, Schuylkill Co, PA. He worked as Laborer - Steel Mill in 1930. + 13434 F i Gladys June YEICH. + 13435 M ii George Edward YEICH was born on 4 Oct 1926. He died on 17 Aug 1996. + 13436 F iii Elaine Edna YEICH. 7878. Paul Franklin ZIMMERMAN (Lillian May BREINICH , Joanna RUPERT , Amos J RUPERT , Maria BITLER , John Wolf , John , Johannes ). Paul married Mabel LaRue SCHLAUCH. 13437 M i Harry Albert ZIMMERMAN. Paul also married Eva SHERMAN. 7889. Elsie M BREINICH (Franklin A BREINICH , Joanna RUPERT , Amos J RUPERT , Maria BITLER , John Wolf , John , Johannes ) was born in 1917 in Schuylkill Co, PA. She died in 1944. She was buried in Odd Fellows Cemetery, West Mahanoy Twp, Schuylkill Co, PA.
Elsie resided in 1920 in Raven Run, West Mahanoy Twp, Schuylkill Co, PA. She resided in 1930 in Raven Run, West Mahanoy Twp, Schuylkill Co, PA. She resided in 1935 in 15 S 2nd St, Girardville, Schuylkill Co, PA. She resided in 1940 in 15 S 2nd St, Girardville, Schuylkill Co, PA.
Elsie married George D PITTS in 1931/1950 in Schuylkill Co, PA. George was born about 1900 in PA.
George resided in 1935 in 15 S 2nd St, Girardville, Schuylkill Co, PA. He resided in 1940 in 15 S 2nd St, Girardville, Schuylkill Co, PA. He worked as laborer - colliery in 1940. 13438 F i Joan Ann PITTS.